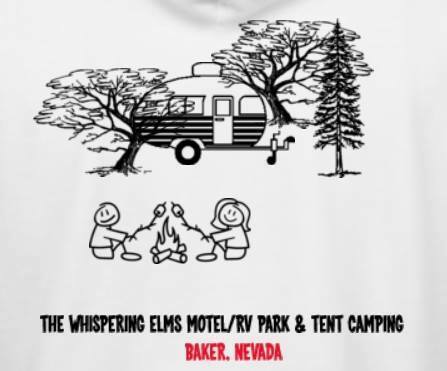 Situated on Nevada Hwy 487, at the base of the Great Basin National Park, The Whispering Elms Motel/RV Park and Tent Camping(in Baker Nevada) offers a peaceful place to relax and unwind after a long day of exploring the many things the Great Basin National Park and Lehman Caves have to offer. Also included , for all campers, use of the bath/shower facilities, coin laundry, free wifi and amazing night skies. **Our Laundry House is currently down and won't be of use till we get it back up and running. Thank you for your understanding. on our free table or maybe a game of shuffleboard or throw some darts with the friendly locals. There is also Direct TV in the lodge to catch up on your favorite teams and sports. and trailers, and plenty of tent camping spaces covered in shade from our towering Elm trees. Microwave, coffee maker, free wifi, and Direct TV. Come enjoy fishing, mountain biking, climbing, hiking and more!